Scientists drilling into a buried Antarctic lake 600 kilometres from the South Pole have found surprising signs of ancient life: the carcasses of tiny animals preserved under a kilometre of ice. The crustaceans and a tardigrade, or ‘water bear’ — all smaller than poppy seeds — were found in Subglacial Lake Mercer, a body of water that had lain undisturbed for thousands of years. Until now, humans had seen the lake only indirectly, through ice-penetrating radar and other remote-sensing techniques. But that changed on 26 December when researchers funded by the US National Science Foundation (NSF) succeeded in melting a narrow portal through the ice to the water below. The intrigue deepened when biologists realized that at least some of the beasts from Lake Mercer were landlubbers. The eight-legged tardigrade resembles species known to inhabit damp soils. What looked like worms were actually the tendrils of a land-dwelling plant or fungus. And although the scientists couldn’t rule out the possibility that the crustaceans had been ocean denizens, they might just as easily have come from small, ice-covered lakes. The researchers now think that the creatures inhabited ponds and streams in the Transantarctic Mountains, roughly 50 kilometres from Lake Mercer, during brief warm periods in which the glaciers receded — either in the past 10,000 years, or 120,000 years ago. Later, as the climate cooled, ice smothered these oases of animal life. How the crustaceans and tardigrade reached Lake Mercer is still a matter of debate. Answers could come as the SALSA team tries to determine the age of the material using carbon dating and attempts to sequence the creatures’ DNA. Piecing together that history could reveal more about when, and how far, Antarctica’s glaciers retreated millennia ago. “This is really cool,” says Slawek Tulaczyk, a glaciologist at the University of California, Santa Cruz, who is not part of the SALSA team. 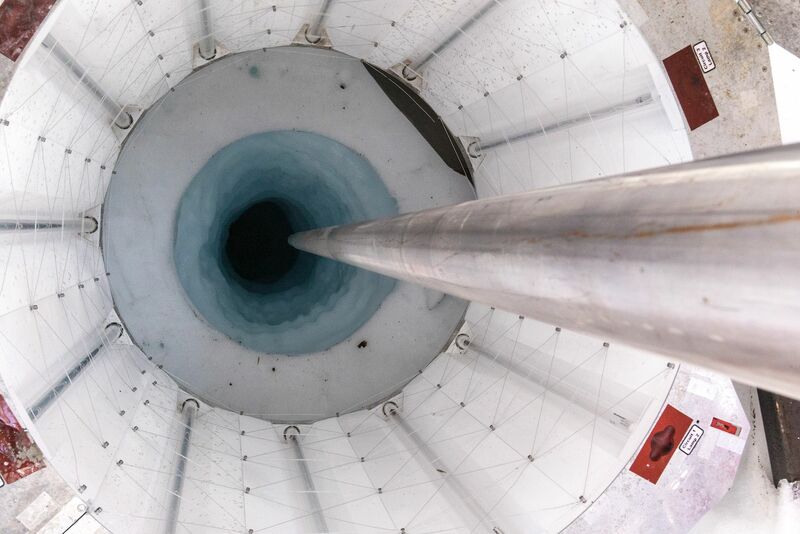 “It’s definitely surprising.” Tulaczyk, who has studied sediments retrieved from beneath glacial ice since the 1990s, says that nothing like that has ever been found before under the ice sheet. He was a co-leader of the only previous expedition to drill into a subglacial Antarctic lake — in 2013 at Lake Whillans, 50 kilometres from Lake Mercer. Scientists found Lake Whillans brimming with microbes, but saw no signs of higher life. Sources: SALSA; M. R. Siegfried & H. A. Fricker Ann. Glaciol. 59, 42–55 (2017). In the case of Lake Mercer, Tulaczyk says, rivers under the ice could have washed the animal carcasses and fungi from the mountains down to the lake. Or the creatures might have frozen onto the bottom of a glacier that dragged them out of the mountains as it advanced. In other words, the key to understanding a long-ago period of the Transantarctic Mountains’ history could be buried at the bottom of a lake 50 kilometres away. The saga began on 30 December, as SALSA scientists hoisted up an instrument that had measured the water temperature, and scraped grey-brown lake mud off it. When Harwood slid the mud under a microscope, he found what he was hoping for: the shells of diatoms, photosynthetic algae that lived and died millions of years ago, when Antarctica was warmer and an ice-free ocean covered the area that is now Lake Mercer. But he spotted something out of place among the glassy diatom shards: the shell of a shrimp-like crustacean with legs still attached. Its carapace was speckled and discoloured “like an old leaf that’s been sitting on the ground for a season”, Harwood says. The palaeontologist soon found another fragment of a crustacean’s carapace, this one a healthy amber hue, and still bristling with delicate hairs. ”It looked really fresh,” he says. “Like something that had been living.” The idea that live animals might be flitting around in this dark pocket of water, sealed off from the outside world, seemed at once reasonable and outlandish. Samples of the lake’s water contained enough oxygen to support aquatic animals, and were full of bacteria — at least 10,000 cells per millilitre. Harwood wondered whether small animals, originally from the ocean, might survive there by grazing on the bacteria. There were other reasons to suspect that sea animals could have got into Lake Mercer. Five thousand to ten thousand years ago, the ice sheet briefly thinned, allowing seawater to intrude under floating ice that was hundreds of metres thick and reach what is now Lake Mercer. Any animals that came in with the ocean could have been trapped in pockets of water when the ice sheet thickened and once more came to rest like a lid on the sea floor. Scientists know that something similar, although less extreme, has happened in other parts of Antarctica. The gradual uplift of the continent transformed shallow ocean bays into isolated lakes. And tiny marine copepod crustaceans seem to have survived for thousands of years in some of those lakes, likely spending long periods trapped under several metres of permanent ice. Those ice-covered lakes still receive dim sunlight — giving crustaceans algae to eat. But subglacial lakes such as Mercer are tougher environments. No sunlight penetrates their frozen caps, so bacteria survive by gnawing on minerals and organic matter from microscopic plankton and diatoms that lived millions of years before, when the lake bed was part of an open ocean. Most biologists do not believe that bacteria in these lakes can grow quickly enough to supply food for even the smallest aquatic animals. John Priscu, a lake ecologist at Montana State University in Bozeman and the SALSA project’s leader, was cautious but excited when Naturespoke to him by satellite phone on 3 January, several days after the animal carcasses were found. He worried that the critter bits his team had found in the lake might simply be contamination carried in by dirty equipment. “I’m pretty cautious about making claims,” he said — while allowing that discovering animals alive in Lake Mercer “would be a real wow moment” if it happened. (Below, see a video of the plunge into Lake Mercer). To rule out contamination, his team re-cleaned its gear and retrieved more mud. Harwood continued to find crustacean shells and organisms that vaguely resembled worms when he peered at the new mud with his microscope. But neither he nor anyone else at the SALSA camp specialized in studying animals. A more reliable interpretation would have to wait until other scientists saw the samples. That happened on 8 January at McMurdo Station, an NSF base 900 kilometres northwest of Lake Mercer on the Antarctic coast. When an animal ecologist named Byron Adams trained his microscope on a bit of the mud retrieved from Lake Mercer, he quickly spotted some familiar organisms. A new understanding of their importance began to emerge. Adams, a researcher at Brigham Young University in Provo, Utah, who is not part of the SALSA team, recognized the worm-like objects as thread-like plants or fungi. He had seen those, along with the crustaceans and tardigrade, both alive and dead, in a region of Antarctica called the Dry Valleys that is free of glaciers. He had also seen some of these creatures in the Transantarctic Mountains, which cut through the continent’s interior. Adams was all but certain that the organisms had been dead for millennia by the time the scientists scooped them out of the lake. He believed that they had once lived in the Transantarctic Mountains and were transported down to Lake Mercer sometime after they died, anywhere from thousands to tens of thousands of years ago. The remains are young compared to those of other ancient organisms found in the lake, such as the diatoms, which are thought to have lived millions of years ago. “What was sort of stunning about the stuff from Lake Mercer is it’s not super, super-old,” he says. “They’ve not been dead that long.” And such well-preserved carcasses provide an interesting opportunity. By determining how long ago these organisms lived, and what kind of environment they required, biologists can learn something about Antarctica’s past succession of warm and cold spells. The SALSA scientists finished their work at Lake Mercer and sealed off the borehole on 5 January. As they head home with their samples, the project is entering a slower, more methodical phase. In the coming months, the team will attempt to establish the age of the animal remains using radiocarbon dating; this would reveal if they are younger than about 40,000 years. The scientists will also try to sequence scraps of DNA from the carcasses, the mud and the lake water in the hopes of finding out whether the crustaceans belong to marine or freshwater species. Chemical analyses of carbon in the carcasses could also confirm whether the animals lived in a sunlit ecosystem, fed by photosynthetic algae — or whether some might have survived for a time in a dark, subglacial environment. Adams, for one, hasn’t completely let go of the possibility that some animal used to live under the ice, or even still does. As he looked through the mud from Lake Mercer, he was “hoping to see something alive — that’s what I wanted to see”. But it was a tiny sample, barely a teaspoon’s worth. If Adams could have examined more of the muck, he says, “it’s possible that you could still find things that are alive”. The Hollow Earth: Is there another Sun and an Advanced Civilization living in the Center of the Earth?